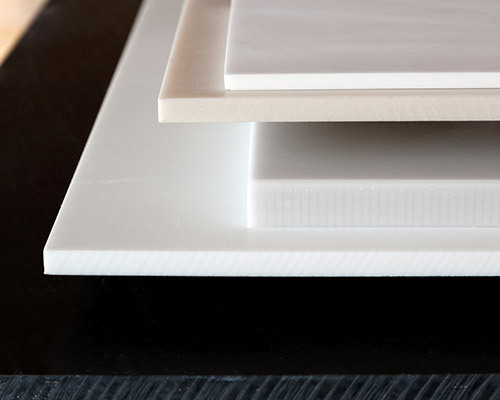 DuPont™ Corian® is an advanced mix of natural minerals and acrylic polymer for furnishing and architecture surfaces with high services and a great planning versatility. With its mixture of services and esthetic quality, DuPont™ Corian® is perfect for creative uses, new designs and long-lasting employments: the idea will be done thanks to DuPont™ Corian®. The palette of colours now offers more than a hundred chromatic solutions, which are able to satisfy every esthetic and stylistic need. DuPont™ Corian® can be cut, milled or worked as wood, mould, thermoformed or inlayed: the different design options are unlimited. DuPont™ Corian® is perfectly smooth, without any visible joint, and could be used in the creation of big architectural elements, in order to integrate with other materials like tiles, steal, wood, granite and glass. RESISTANT: DuPont™ Corian® oes not flake, withstand everyday use and can resist to most of the crashes, scratches and cutting. HYGIENIC: It is certified as hygienic material according to the international law DIN EN ISO 846. REPAIRABLE: Damages caused by the wrong use can be usually repaired in the same place without replacing the material. NON-TOXIC: It is used in public places as airport check-in desks, walls and hospital and hotels work-table. INVISIBLE JOINTS: The possibility of realizing invisible gluing and uninterrupted surfaces with invisible joint makes possible to have innumerable varieties of designs. THERMOFORMABLE: It can be thermoformed at a controlled temperature and modeled in two-dimensional and tridimensional shapes. ECOLOGICAL: It is GREEN GUARD Indoor Air Quality Certified. 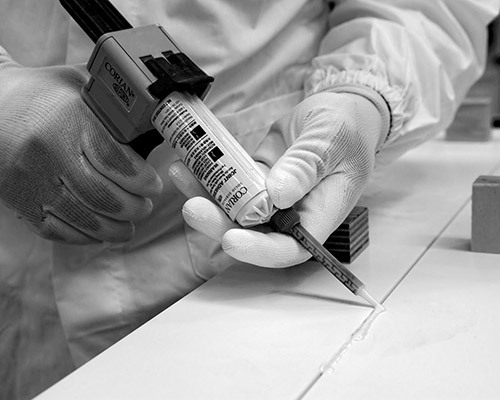 RELIABLE: Each installation made by the members of Corian® Quality Network comes with a ten-year warranty. 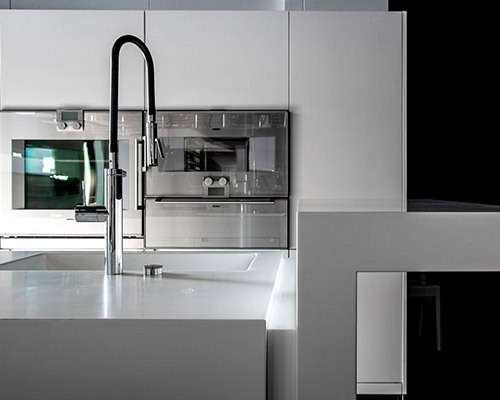 With its own modern personality, DuPont™ Corian® is suitable for every kitchen style and design. It allows to melt sinks, work-tables and walls in a single uninterrupted surface without any visible joints, where the aesthetic harmony lives with a functionality without any compromises and a faultless hygiene. DuPont™ Corian® is a intrinsic solidity material that can be modeled, carved, cut and used with other materials, giving free expression to the creativity in the planning of seats, tables, bookcases, cupboards and many other furniture components. Translucent in some colours and thickness, it is perfect not only for the environment illumination, but also for the creation of lamps, furniture with spectaculars shining effects and bright objects embellished by a range of texture that leaves speechless. 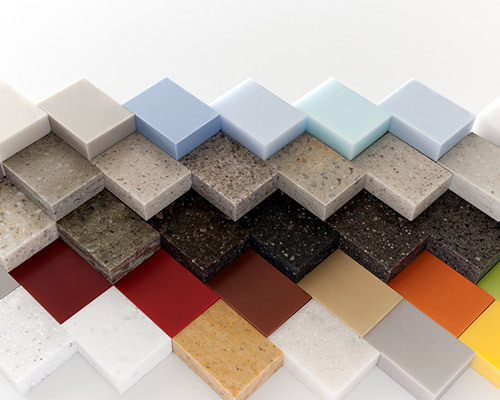 COLOURED: DuPont™ Corian® offers a countless range of colours. You can choose either to work with one colour, creating a neutral base for the design, or to experiment some matching studied to capture the attention. DuPont™ Corian® can be used also for particular effective inlays or as a versatile complement of other materials such as metal, wood, stone, etc. TRANSLUCENT: DuPont™ Corian® extraordinary translucence qualities particularly stand out in light colours and in thin sheets. Many designers use the material to create lamps or shining effects in different applications. COLORS IN THE WHOLE MATERIAL: There are colours and the decorative patterns in the whole thickness of the material; therefore, they are not subject to wear.